The dressing can make or break your potato salad. You can easily make a homemade dressing for your salad that will have everyone coming back for seconds. 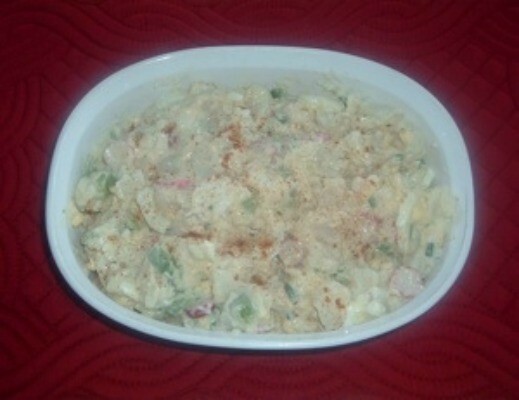 This page contains potato salad dressing recipes. It is by far the best potato salad dressing I have ever used. It is tangy and sweet and just takes a few minutes to cook and it is well worth it. This makes a large recipe. If you want to use all the dressing at once, boil 5 pounds of potatoes. Otherwise, use just 1/2 and refrigerate the rest. It will keep for about 6 weeks refrigerated. Beat the 3 eggs. Add sugar and vinegar and stir thoroughly. Cook over medium heat till thick. Let cool and then add 2 cups of Miracle Whip. NOTE You can use any potato but I prefer the red for potato salad. I used 6 hard cooked eggs, 1 small pepper, 8 green onions, 8 radishes. However, you can add or subtract any ingredients for potato salad. It is a matter of personal preference. This is a great, old-fashioned potato salad dressing. Cook until thick, thin with cream until smooth but not thick or too thin. Just until good consistency for potato salad.